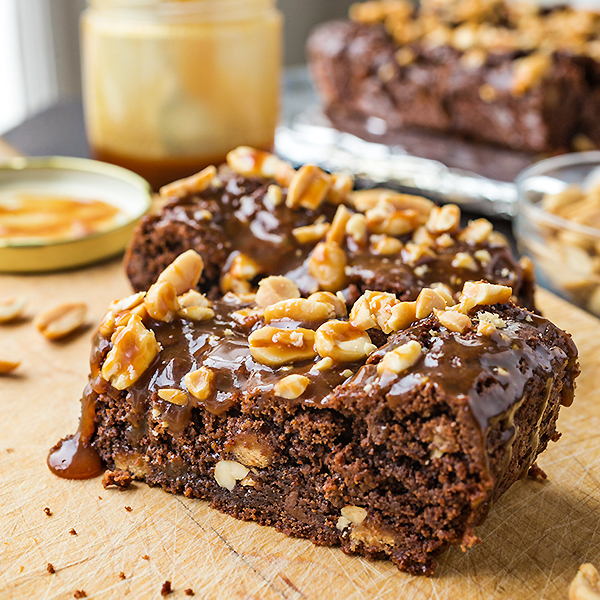 Getting into one’s kitchen to whip up something tasty can be fun and rewarding anytime; but when you get in there and prepare something specifically to comfort someone you love and hold dear, something like these rich Snickers Brownie Bars, then there’s nothing better! For a momma, there is no better feeling in the world than to see her child, young or grown, enjoy a meal or dessert that she’s prepared with complete abandon and gusto. Though my passion for cooking and baking—pretty much everything food related in the kitchen—comes out of my nurturing nature, and out of my desire to feed and to please—to comfort—any person that would be a willing recipient of it, there’s something truly special, in my opinion, about preparing food for one’s son or daughter, especially when that child has been away from home for a while beginning his or her own life. On a personal note, for my husband and I, our eighteen year old son has been away from home for the past (almost) 3 months now. Early in his teens he had developed a passion to become a member of the military in order to serve our country, and before his senior year, had made the decision to join the U.S. Marine Corps after graduating from high school. And we’re so proud of him! So he’s been away at boot camp, training and earning his title of U.S. Marine, and we’ve been holding down the fort here at home, writing him tons of letters and eagerly (and as patiently as possible!) awaiting his wonderful letters to us, as well. Both of us have missed our son so very much, but you can imagine (especially if you yourself are a mom) how much I’ve personally missed my boy and his wonderful appetite for my food! I have to share with you that in the letters that he’s written home, he’s mentioned how much he’s missing my cooking (swoon! ), and can’t wait to come back home for his short leave to enjoy it and “pig out” just a little. And that’s music to this momma’s ears! I can only imagine how hungry all of these young men are with everything that they’re going through both physically and mentally. So, as you can imagine, I’ve began to really look forward to his all-too-brief homecoming in early October, and the opportunity to care for him a little through my home-cooked meals! Happy, happy! 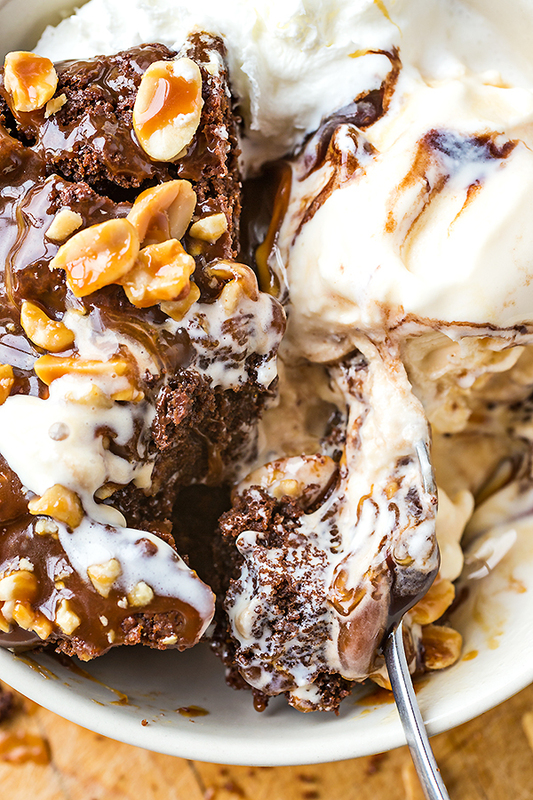 Which leads me right to this shear decadence of an ooey-gooey nature that you see before you, these Snickers Brownie Bars. Oh….yes! Whenever I would bake, my son, with his voracious appetite and hummingbird metabolism that just “burns” through everything that he ingests at lightning speed, would be one happy customer and wouldn’t even ask if he could take half the plate of cookies, or eat 4 out of the 8 scones in one sitting—he’d just help himself! And that’s what I love about him. That’s what I love about any kid that does that, because it demonstrates complete comfort and ease—joy—in partaking of something that “hits the spot”, without any hangups. And that’s a big part of why baking for my son, in particular, is so fun. In his last couple of letters home, he had written what a sweet tooth he had, but that he was behaving himself and not “sneaking” any dessert items from the chow hall line when their Drill Instructors aren’t looking, since they’re not supposed to be having any of those types of goodies while at this stage of boot camp. So knowing that, I’ve really been wanting to create something “in honor of” our son that I know he will enjoy when he gets back (so that we can put some of that “meat” back on his bones that he’s lost), that’ll give him that taste of home that he’s been missing so very much. Snickers candy bars are one of my son’s favorite chocolate bars. I mean, what’s not to love? 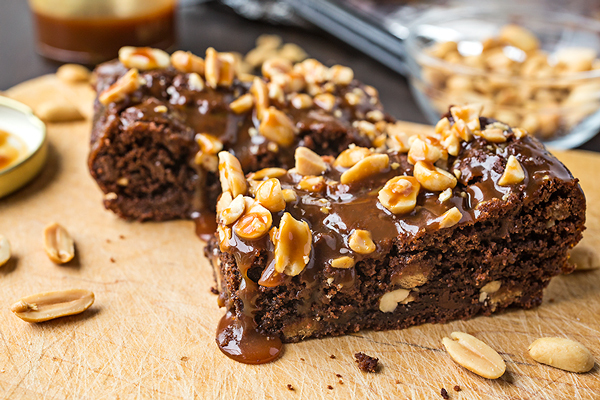 There’s chocolate, peanuts, caramel, gooeyness…you get my point. 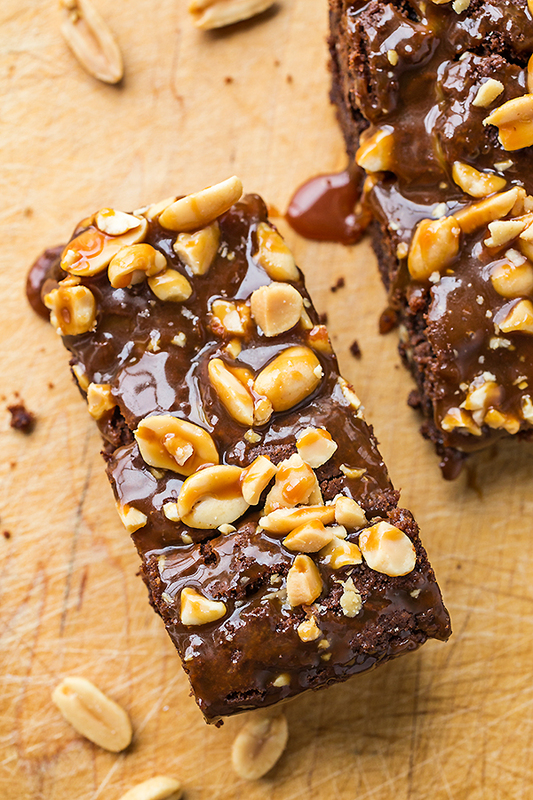 So I wanted to create something sweet, something baked, that would represent that candy bar and all of its delicious and decadent flavors well. And Snickers Brownie Bars were exactly what I was thinking. 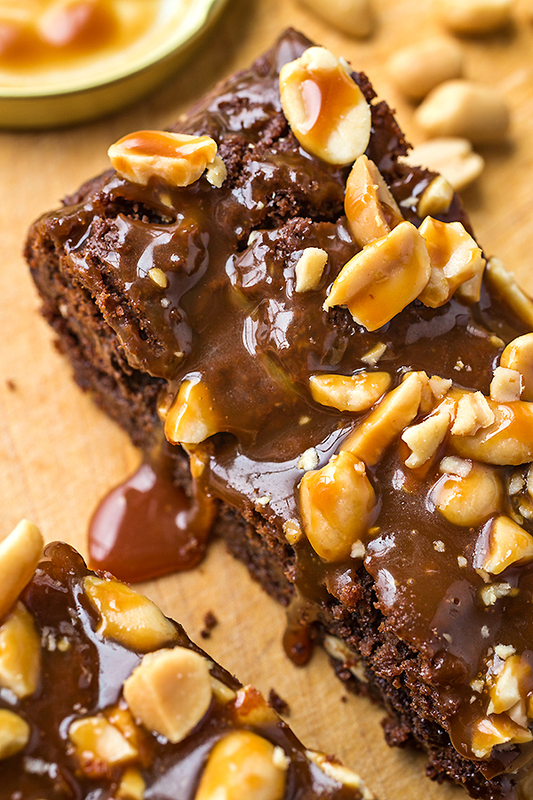 Fudgy, rich, chewy, nutty, and caramel-y—how can you go wrong with that? 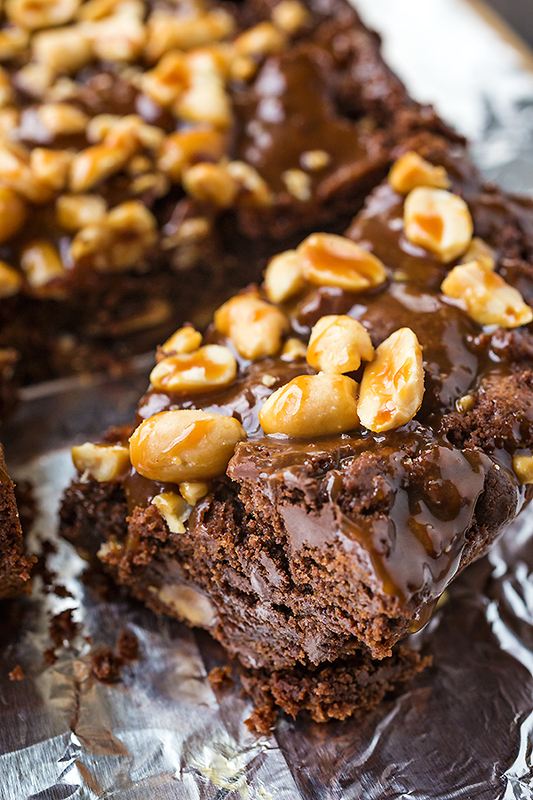 And in brownie form?! It’s the perfect treat to indulge in! So I’m a happy momma because I have something super fun and super delectable to prepare for our boy when he comes back for his leave, and before he goes back out again into the next phase of his training. Making meals for our loved ones, whether they be of the savory or sweet variety, are the best kinds of meals to get into our kitchens to prepare. And it’s the love for those people that we hold precious and dear to us that is the best reason of all to get into our kitchens and cook up something extra nurturing and extra special. Taste what’s good and pass it. -Preheat your oven to 350°, and line a 11 x 7 x 1.5” baking dish with enough foil so that it hangs a little over the sides (easier lifting after baking), and mist with cooking spray. -Into a small saucepan add 4 ounces of the milk chocolate chips along with the butter, and slowly heat just until melted together; whisk/blend to combine, and pour into the bowl of a standing mixer to cool for 5-10 minutes. -Meanwhile, combine the flour, cocoa powder, baking soda, and salt, and put those dry ingredients aside for a moment. -Once the melted chocolate/butter has cooled slightly, add to it both the sugars, the eggs, the vanilla, and the peanut butter, and using a paddle attachment, mix to combine well. -Add in the dry ingredients, and mix just until combined, and then pour in the remaining 4 ounces of milk chocolate chips and the caramel bits, and mix just until those are incorporated in. -Pour/spoon about half of the batter (it will be a little thick) into your prepared baking dish, and smooth it out; sprinkle evenly over the batter about half of the chopped peanuts (about ¼ cup), and spoon the rest of the batter over that and smooth out. -Bake for about 40 minutes, and allow to cool in baking dish for about 20. 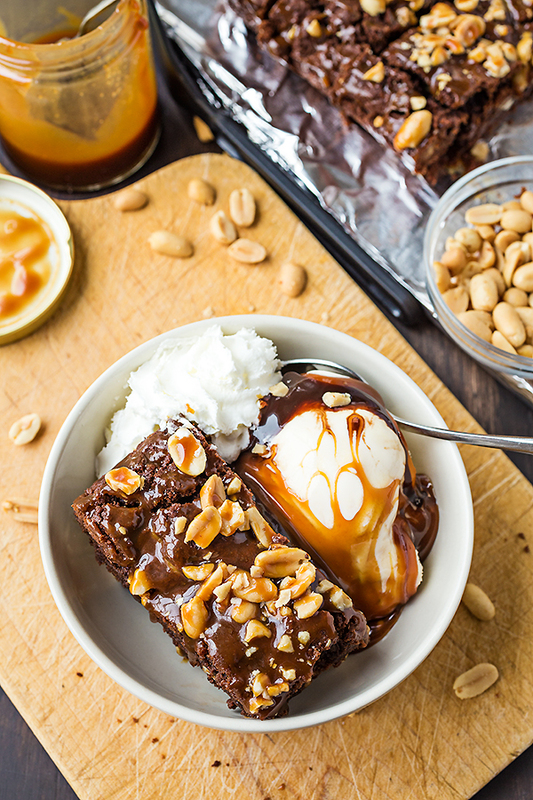 -Lift the brownies out of the baking dish and allow to completely cool; then, drizzle over the top about ¼ cup of the caramel sauce, and sprinkle over the remainder of the chopped peanuts, then drizzle more caramel sauce (about ¼ cup) over the peanuts to make the top nice and gooey. 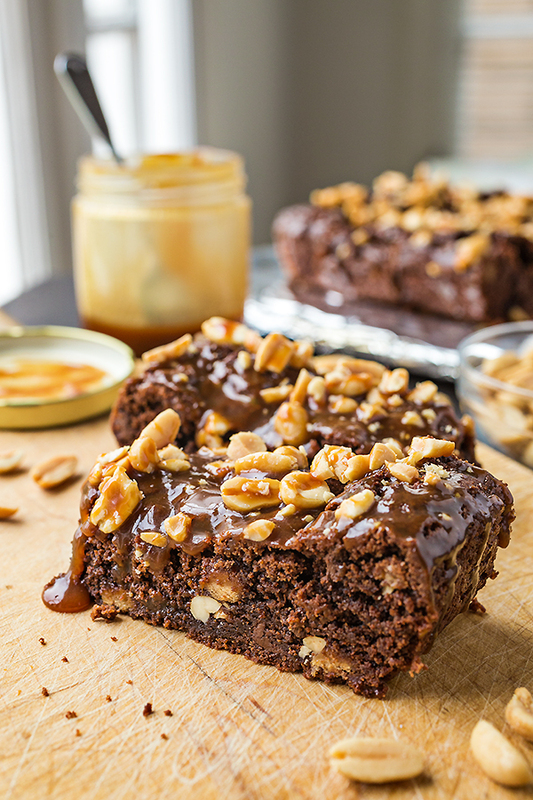 -Cut into bars and serve, a keep uneaten brownies well-covered with plastic wrap. This looks delicious… I would just add that the woman serving are probably pretty hungry too! Yes, Kiara! How could I forget the women?? 🙂 Certainly they’re hungry! And thanks for your comments. Thank you to your son for his service! And thank you to his mama for making these brownies. I love how they have nuts AND Caramel AND peanut butter. Those pictures with the melty ice cream are makin’ me hungry! 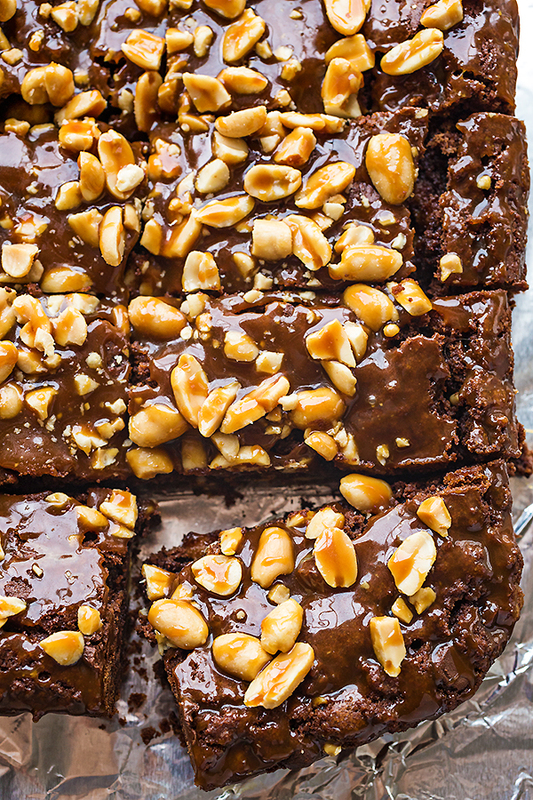 There really is nothing I am craving to indulge in more than one of these brownie bars.. they look incredible. GOD BLESS YOUR SON AND HIS WHOLE PLATOON! You BOTH must be very proud. We pray for all men and woman serving our COUNTRY every single week at Mass…….Thank him on behalf of US ALL! Geri, that is so, so appreciated!! Thank you for your kind, precious words. Blessings to you, too!